It's because I think too much: Kaboodle A-list! Anyway, just found out I've been made an "A-lister" on my favorite website, Kaboodle.com. If you've yet to discover Kaboodle, you're missing out. A lot. I promise. Being on the Kaboodle A-list just thrills me because I adore this website. So thanks to the Kaboodle team! I ♥ you! 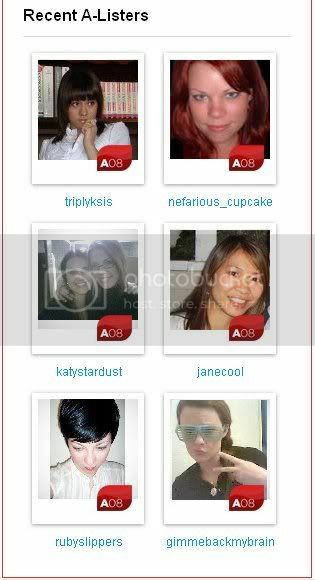 Congrats to the other recent A-listers: nefarious_cupcake, katystardust, janecool, rubyslippers, and gimmiebackmybrain. I agree, those members definitely deserve A-list status! I didn't realize I was already an A-Lister and just nominated myself hahaha. That's so awesome! I agree, totally correct choices. congrats my dear. you definately deserve it :)! awesome! I keep meaning to check out that website. ALL women think too much. You are not alone (where do you think conspircy theories come from?). Okay, try it on me. Read my blog a bit and see what your busy thoughts tell you about me. Cheers! Cormac. Congrats to you, Adiel...You're a gal with a ton of A List Class & Glamor! You go girl, I have no idea what it is, but glad you made the top! You're so cute. Thank you! PS: I "friend'd" you on weardrobe.com, just made an account! ;) Hope that was you?